On view at the Palazzo Grassi- François Pinault Foundation in Venice is Rudolf Stingel. The exhibition opened on April 7th and is on view until December 31st, 2013. Many new sets of eyes are getting a chance to view the installation on the occasion of the 55th Biennale di Venezia which opens to the public on June 1st and is currently the focus of attention for most art press from all over the world. 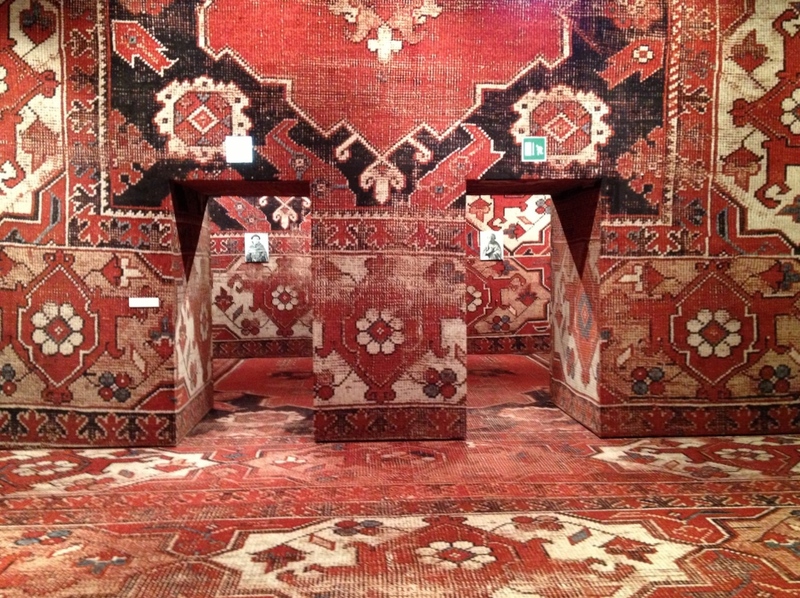 For this exhibition, Stingel has once again utilized carpet. Upon first entering the space, the expansive, Oriental patterned carpet seems a bit out of the ordinary for Venice and even somewhat pixelated upon closer inspection. It appears to show a bit of wear from visitors over time and with the impressive history of the François Pinault Foundation, the show of usage could at first be expected. Walking up to the first level above the canals, reveals that the entire interior of the building has been covered in the decorative carpet, floors and walls. This is not the first time that Rudolf Stingel has used carpet as his choice of medium and another was recently on view in NYC 1993: Experimental Jet Set, Trash and No Star at the New Museum. The exhibition is his largest monographic presentation in Europe and tracks the signs of visitors and also offers a selection of paintings ranging from conceptual abstraction to figuration. The effect of the literal wall-to-wall carpeting can be a times dizzying. It might even take more attention then one initially realizes. If willing to spend the time to observe the nuances that continue throughout the three floors, viewers will find that the work is both painterly and sculptural. It is a way to monumentalize space while also creating a level playing field; nothing feels grander than the next. As for the paintings, they range in size and most are hung centered on the wall. Stingel usually works in black and gray and these paintings do not stray far from that except for also having a bit of metallic silver (not unlike the much younger Jacob Kasay). The abstractions delve into anti-narrative territory yet somehow seem to be in dialogue with the nearby canals, swirling moments on each canvas formed as paint dances across the surface. These works are in stark contrast with the sharply defined details and bold colors of the carpet. Rather than continue with the abstraction, the third floor in particular opens the door for representational work. Subjects range from Catholic Saints to the Madonna and all seem to be originally based on sculptures. The angular shadows that are normally found on carved faces and filtered through harsh sunlight exist in rectangular frames, and hang on the ever present carpet. Here is where the show gets interesting. All of a sudden the artist has taken away the projected glory of his subjects. While meticulously painted, it’s as if the works are installed on the floor, or are we as viewers standing on the wall? Forward and backwards can be easily negated as the patterns repeat over and over and the only spatial guide is the lighting above. Should the artist have covered the ceiling, taken away our point of reference and left us in a darkly carpeted realm? This is both a weakness and a strength as obviously lighting is needed for viewing purposes but something can be said about a world that is enmeshed with a symbol that often represents a particular culture and or social status. In this case the wealth can be redirected to the patron and collector François Pinault while culturally the artist has stepped outside of Venice and references a photograph of Sigmund Freud’s study in Vienna, whereas oriental carpets covered the floors, walls, sofa and table. Palazzo Grassi is located in Campo San Samuele, Venice, Italy. From the train station, Piazzale Roma or Tronchetto, you can get to Palazzo Grassi by using the motorboats (vaporetto) on lines 1 (stop Sant’Angelo) and 2 (stop San Samuele).